Speeding Light: Emoticon Magic (E on Day 5 of A to Z Challenge 2015). (E on Day 5 of A to Z Challenge 2015). You like them, hate them but you cannot ignore them. Because yes, they have the power of flashing a smile on your face when you are low, or make you go mad at a friend who purposely sent you one for making you go in rage with angst. Allow me to reinvent the old adage - Emoticons speak louder than words. People don't use words anymore. From Whatsapp, Viber, Skype to BBM the struggle for finding the best emoticon to fit into our emotional state is on. Feeling feature on Facebook allows a user to add a feeling accompanying an emoticon. For feelings that are not auto-listed, a user can put them up as status and use a suitable emoticon to express one's feeling. Drop in the comment box your funny, serious, not-so-funny, naive, boring, ...... Emoticon Moment. Author's Note: While emoticons are creative way of expressing how one feels, sad faced emoticons get my blood boiling. Just the look of it, no matter who sends it.. Arghh! P.S. : Emoticon Magic for E - April 6, 2015. 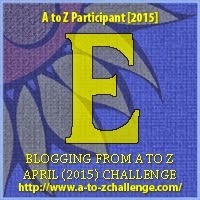 My fifth post for the A to Z April Challenge. Such a cute poem..!! and the emoticons.. they're bliss..